Campaign Against Canned Hunting, the NGO that has spent more than a decade exposing the abuses of lion farming and canned lion hunting, has extracted from the 101 page document those provisions that affect lions and comments upon them below. If the TOPS regulations are intended to protect biodiversity, then they can accurately be described as cosmetic, misdirected and irrelevant. Canned lion hunting is an industry whose whole business model violates the Animals Protection Act of 1962. Imagine the public outcry if livestock farmers allowed hunters to come on to their land and use their sheep or cattle for target practice. There would be a public boycott of S.A. meat and meat products. Consumers would be up in arms. Yet the TOPS regulations wrongly assume that canned hunting (the use of livestock for target practice) is not illegal – and then provides some cosmetic restrictions, when it ought to be banning the whole lion farming industry. 2. Proposed amendments to the TOPS regulations seek to stop the current abuses of shooting arrows into elephant, lion and rhino – but bow hunters may continue to shoot buffalo and other large animals. 3. Lion farms will no longer be permitted to let hunters shoot tame lions in their enclosures, or even in an ‘adjacent’ camp, but so long as the target animal is moved out of its enclosure and in to the next-but-one camp, hunters are free to shoot as many arrows or bullets as they wish in to their living target. See how cosmetic this is: how is biodiversity affected whether the tame lion is shot in this camp or that? Who cares? 4. There are other meaningless restrictions listed in the TOPS regulations. For example, hunters may only set a pack of dogs on to a tame lion if it has been wounded first. It is quite possible that even these feeble and inadequate ‘protections’ are invalid and unenforceable. The Supreme Court of Appeal has already determined that lion farming is ‘a closed circuit’ which has nothing to do with conservation. The industry therefore falls outside the jurisdiction of the department of the Environment, and in the purview of the department of Agriculture. So, just as Minister van Schalkwyk’s attempt to impose a 24- month wilding rule upon lion farmers was held to be outside his powers, so even the pretence of protective conditions described above can be struck down by the courts. 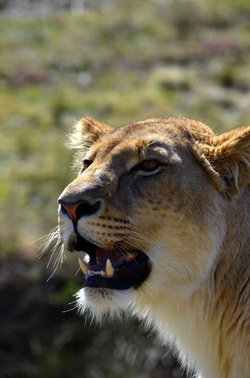 I have posted a blog explaining why I think that the Supreme Court judgment is wrong, and that lion farming very much threatens conservation of wild lions. In any event, collapsing provincial conservation structures do not have the capacity to monitor compliance. By facilitating lion farming and canned hunting, the TOPS regulations show how irrelevant government has become. Government has become background noise and change will have to come from civil society. The TOPS regulations are not worth the paper they are printed on. Only when the flow of dollars has been cut off will this evil industry finally be brought to an end.